Have you ever heard of Chicken Week? I haven’t, either, but I’m assuming it has Mike Rowe narrating the gruesome details of chickens roaming the streets of Salt Lake City, picking on innocent City Creek shoppers. Or, it could be Wasatch Community Gardens’ third annual week promoting local “eggriculture” in Salt Lake City. To kick off Chicken Week, Wasatch Community Gardens is hosting a brunch at Squatters. 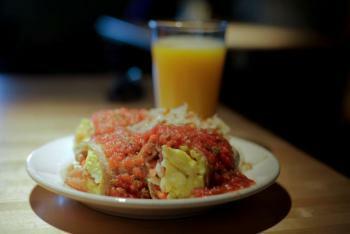 For $15 you will enjoy a delicious breakfast burrito made with locally-sourced eggs as well as endless coffee and juice. Squatters is donating the location, staff, and food, so all proceeds will go directly to benefit Wasatch Community Gardens. The brunch is this Saturday, June 30th. You can sign up for one of three seatings: 9:00, 9:45, or 10:30. After your brunch you can take yourself on a self-guided tour of some of SLC’s premier chicken coops.